“Noah Webster, The Schoolmaster of the Republic,” 1886 print by Root & Tinker. Courtesy of the Library of Congress. The image of Webster at the center is an engraving based on an oil portrait, c. 1823, by American painter Samuel F. B. Morse (1791–1872). 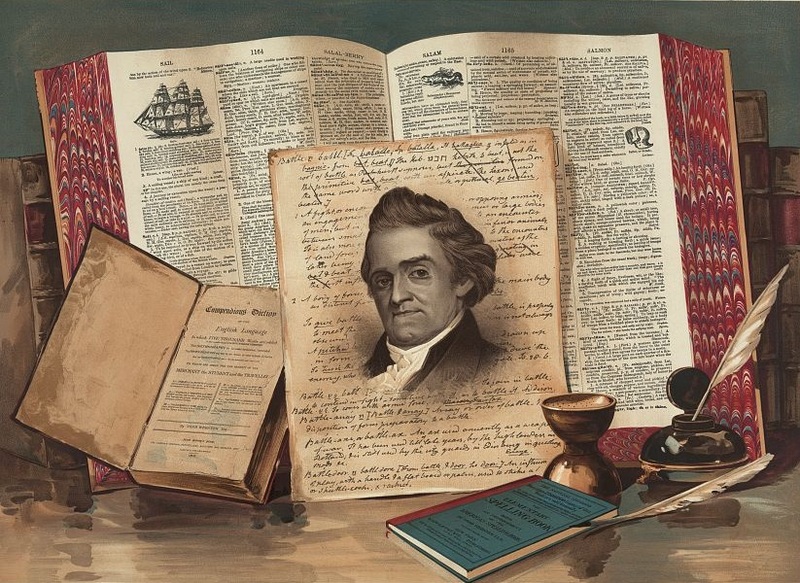 Noah Webster’s name will endure—as it has already endured for two centuries—for his Compendious Dictionary of the English Language published in 1806, as well as for the larger American Dictionary of the English Language that appeared in 1828. It was a lifelong project begun much earlier. In 1783, as a twenty-five-year-old schoolteacher in Goshen, New York, he began publishing his Grammatical Institute of the English Language, the first part of which became The American Spelling Book. (Part Two was a guide to grammar, and Part Three contained a reader.) Commonly referred to as the “Blue-Backed Speller” or the “Old Blue Back” for its distinctive covers, the spelling book sold tens of millions of copies during the subsequent century as it became the required text for (and the bane of) generations of American students. Less familiar to many readers is the pivotal role Webster played in the founding of the American republic and the adoption of its new constitution—and his advocacy was very much related to the success of his publications. The difficulty of securing copyrights from thirteen separate state governments for each subsequent edition of his spelling book convinced him of the need for an effective national government, and he became an advocate for the Federalist cause. Until the new Congress passed the Copyright Act of 1790, he was forced to spend much of his time during the 1780s traveling from state to state to obtain the copyrights for his various works. Webster intially advocated for a stronger national government in a 1785 pamphlet titled Sketches of American Policy. He later boasted that his tract was the first proposal for a new constitution—a claim the historian Joseph Ellis calls “debatable [since] several new schemes for a more effective government came into circulation about this time.” But Webster’s influence was extensive, in part because of his ability to distribute the pamphlet as he traveled among all thirteen states. In fact, in an article written for a Connecticut newspaper in 1786, he coined the terms “federal” and “antifederal” to describe the opposing factions. In the end, of course, the opposing factions reached a compromise. When the Massachusetts legislature hesitated to ratify the Constitution, John Hancock proposed ratifying it with the proviso that various amendments be adopted afterward—an idea followed by four other states. The ten amendments we know as the Bill of Rights were finally adopted at the end of 1791. Notes: In the second paragraph Webster refers to the Magna Charta and the view, first asserted by seventeenth-century royalists to undermine the claim by the House of Commons to being immemorial, that there was no record of a Commons until the 49th year of the reign of Henry III (1265). The statute of the 2d of William and Mary, mentioned at the top of page 670, is the Habeas Corpus Act (1679), passed to prevent imprisonment without proper legal authority. 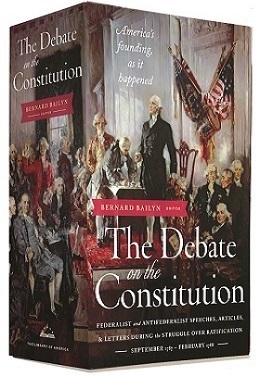 One of the principal objections to the new Federal Constitution is, that it contains no Bill of Rights. . . . If you don't see the full selection below, click here (PDF) or click here (Google Docs) to read it—free!